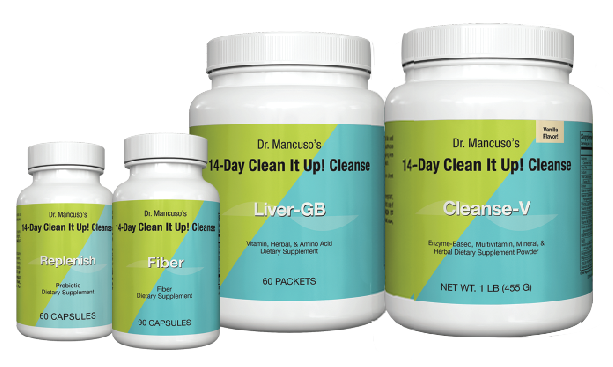 Dr. Mancuso has designed this 14 day cleanse program to provide you with a better understanding of nutrition and to help you craft a more healthful diet, based on your goals and needs. This program was not designed as a weight loss program but most participants experience a reduction in body fat because with the removal of the toxic load, the body is more efficient in burning fat. It is also not a fast. Rather it is a program designed to help identify and correct many metabolic imbalances such as allergies or food intolerances, yeast and bacterial overgrowth, sluggish metabolism and leaky gut syndrome, that could be contributed to a lack of energy, as well as weight-loss resistance.